The legendary Fremont at the heart of the Fremont Street Experience and downtown Las Vegas celebrates 50 years, opening May 18, 1956. It's built its reputation on its welcoming atmosphere and great value. The Fremont is a symbol of what visitors have always loved most about Las Vegas. It is the excitement, the hospitality, the allure of the lights and the serious gambling that has helped make Las Vegas such a premier destination. The Fremont's familiar marqee is world-famous and has been featured in a multitude of movies with downtown as their backdrop. In addition to all that appeal, a claim to fame and part of the Fremont's success has been the incredible array of fine foods offered at their award-winning restaurants, considered by its many repeat guests as the best value downtown. You'll see that the Fremont has all the things that have made Las Vegas one of the most fabulous cities in the world. And now, with the amazing Fremont Street Experience sound and light show at its front door, the Fremont Hotel & Casino is more exciting than ever. The Fremont Hotel and Casino boasts 447 guest rooms and suites, in the heart of the legendary Fremont Street Experience. All of the Fremont's cozy guest rooms have recently undergone a complete transformation. The rooms' dcor and furnishings create a tranquil respite from the high-energy casino floor, giving you the opportunity to relax and enjoy the comfortable surroundings. Guests can be assured that the friendly faces and helpful personnel of the Fremont will make your stay a wonderful experience. All guest rooms feature the following amenities: iron, ironing board, hair dryer, wall safe, and television channels, including ABC, CBS, FOX, NBC, CNN, ESPN, TBS and Univision. Need more money? Cash an out-of-town check. It's easy at the Fremont and we'll even set up a personalized account for you. With proper identification, a major credit card, and a valid driver's license, we'll gladly cash your approved personalized check up to $1,000. Look no further than the Fremont. Simply check with the cashier's cage and provide them with a little information. If your bank will verify information over the phone, we can process your application in approximately one day. The Fremont always offers hotel guests free coverd valet parking. Traveler's checks- The Fremont is happy to accept your Traveler's checks with proper identification. ATMs are located next to the main casino cage. At the Fremont, Main Street Station, and the California, the Sam's Town complimentary shuttle service provides a full schedule of service to the Las Vegas Strip and Sam's Town-Boulder Strip. 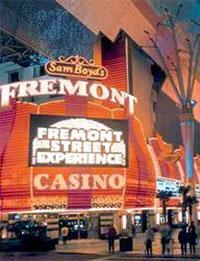 The Fremont Hotel & Casino, with 32,000 square-feet of gaming space, has the latest table games and slot machines. Just steps away from the Fremont Street Experience and free nightly light and sound shows, you'll want to come inside and try your luck on the slot,video poker, and keno machines, live keno, craps, table games and Downtown's best Race and Sports Book. Let the Fremont make you a winner. The variety of table games at the Fremont just seems to get better and better! Wager on double deck pitch games or try the shoe game. Limits are from $5 to $1,000. Try Super Fun 21, a single deck blackjack game, or the new single deck game with a minimum $10 bet and $200 maximum. Try our other table games... "Let it Ride", Progressive Pai Gow Poker, 3/5/7 Card Poker, and 3 Card Poker. The hottest action Downtown with four craps tables starting at $5 with a $1,000 maximum bet with double odds. FREMONT BONUS-Blackjack and Craps players earn bonuses. Ask the Fremont's friendly casino staff how you can qualify. Roulette -$2 minimum with a maximum $4,000 payout. You might just be one pull away for winning the big jackpot! With more than 1,000 slot, video poker, and keno machines, the Fremont offers games for pennies to $5. There are more "ways" than ever before to win with the Fremont's Keno, including 50-cent tickets and multi-games, where you can play up to 1,000 games on a single ticket! Nevada Numbers.. Pick 5 out of 5 and win $5 Million Progressive jackpot...all for $2. Play up to 50 games. Million Dollar Ticket...the latest progessive, starts at $1,000,000. The 10 spot will cost you just $1 and you can play from 1-1000 games and have one year to collect. Wager on your favorite major sporting events or ponies at the Fremont's Race & Sports Book. Futures bets. Surround viewing on state-of-the-art screens. Seasonal promotions for free t-shirts. Hot Slots At the Fremont we have all of the hottest new ticket in/ticket out slot machines for your enjoyment. For those players that enjoy playing on the tried and true coin operated slots, we still have all the old favorites-Blazing 7's Progressives, IGT Double Double Bonus Poker, and others. WHEEL OF FORTUNE SUPER SPIN NOW AT THE FREMONT! This special edition game brings players together in a one-of-a-kind community play experience. Nine video slots surround one giant machine allowing multiple people to play simultaneously. The new linked progressive game also allows players to participate in the same bonus wheel spin for exciting bonus play. Try your luck at the new Wheel of Fortune Super Spin the next time you're at the Fremont! For just a $3 investment, you could be a Penny Megabucks Millionaire! Our friendly casino hosts will guide you to your favorite machine! For over 50 years, this legendary hotel has attracted visitors to its dining venues. There's a dining experience for every appetite and pocketbook. You'll want to experience these award-winning eateries for yourself. The Fremont Hotel and Casino will make your next affair a memorable one. Whether it's a special anniversary, annual class reunion, a wedding reception, a corporate meeting, birthday or a family get-together, let the Fremont's banquet department handle the details. Las Vegas and the Fremont are the perfect combination for any occasion. Located on the second floor away from the hustle and bustle of the casino action, but still close enough to enjoy it if you so desire, the Fremont's facilities can be used for everything from small continental breakfasts, exquisite buffets or sit-down dinners. The attentive staff can produce the kind of event you want within your budget. Special menus also can be created for your function and they're happy to help out with audio and visual equipment.